The practice of separating children from illegal immigrant adults has become highly controversial in the last few weeks, and is something Democrats have highlighted as a practice that needs to stop. The Trump administration has defended the policy by saying illegal immigrants need to know that if they try entering the U.S., they will be prosecuted, which could lead to separation from their children. Officials have said U.S. citizens face the same risk when they commit crimes. But administration officials have also said they support a change to the federal law that requires prosecution and family separation, and have blamed Democrats for current law. Illegal immigration along the southwestern U.S. border has spiked in the last few months, even though administration officials have said they expect Trump’s zero-tolerance policy to eventually dissuade more from coming. A Justice Department spokesman told the Washington Examiner last week the zero-tolerance policy is not expected to lead to a decline in the number of illegal immigrants attempting to make the trek to the U.S. from primarily Central American countries until early fall. Under current practice, HHS takes care of unaccompanied illegal immigrant children as well as now those under the age of 18 who must be cared for while the adults they were apprehended with are prosecuted for illegal entry. This spring, Sessions directed federal prosecutors stationed at the border to bring charges against all migrants that U.S. Customs and Border Protection officers took into custody. However, family units that arrive at ports of entry and request asylum will not be prosecuted because they have not attempted to enter the country illegally, several DHS officials confirmed to the Washington Examiner. They will also be kept together as they go through the asylum process. These groups are detained in DHS facilities while minors are directed to HHS. In an attempt to secure housing for the coming flood of children, HHS selected the Tornillo Land Port of Entry near El Paso, Texas, last week as the first back-up site to temporarily house around 360 minors. The Trump administration is also advancing a plan to tentatively house unaccompanied minors in tent cities located on three Texas military bases due to increasing border apprehensions and a shortage of beds for the underage immigrants. “[Health and Human Services] is running out of space because of the implications of the zero tolerance policy, but also because we continue to see this uptick in numbers,” an official confirmed to the Washington Examiner last week. HHS officials are looking at Fort Bliss near El Paso, Dyess Air Force Base in Abilene, and Goodfellow Air Force Base in San Angelo, the official confirmed. China is the world’s ultimate security state. 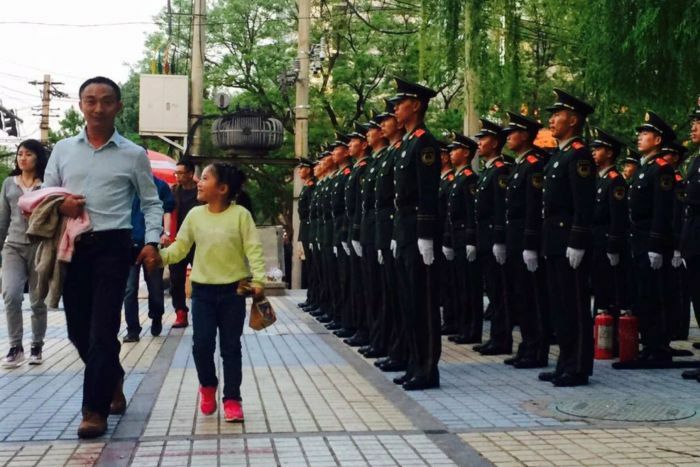 Beijing police proudly boast there is no corner of public space that surveillance cameras cannot see. Every subway entrance involves bag scans and metal detectors. Armed military police stand guard at major public spaces. Various levels of lower down security guards are ever present, right down to the elderly civilian volunteers who keep watch on the street when big political events take place. Away from the capital of this authoritarian superpower things are more relaxed, but the political culture prioritising stability permeates deep. Recently I was in the city of Dandong — bordering North Korea — where an airport video showed off SWAT patrol officers marching around empty streets. Then a cartoon showed how they would respond to Islamist terrorists bringing fire and fury to Dandong — an unlikely scenario to contemplate in a city more well known for being China’s gateway to North Korea. 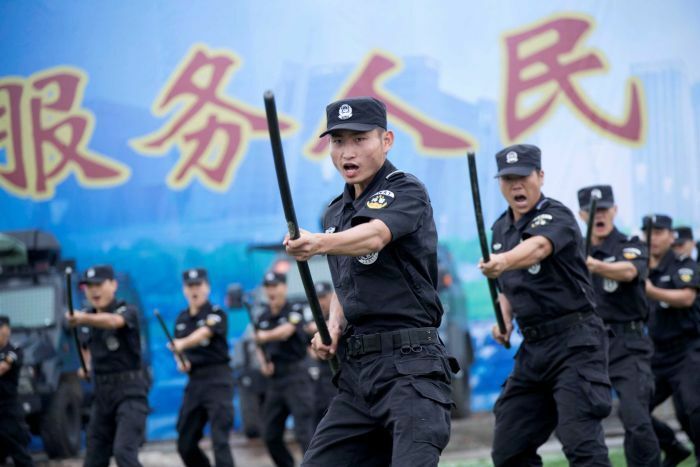 Over in far western Xinjiang the prospect of Islamist terror is far more realistic, and in recent months authorities have mobilised thousands of military police in several public displays of force. The underlying rationale for all this security is to ensure the Communist Party’s control of China remains unchallenged — meaning some political activists and crusading lawyers have felt the full force of China’s security apparatus just as much as terror suspects. 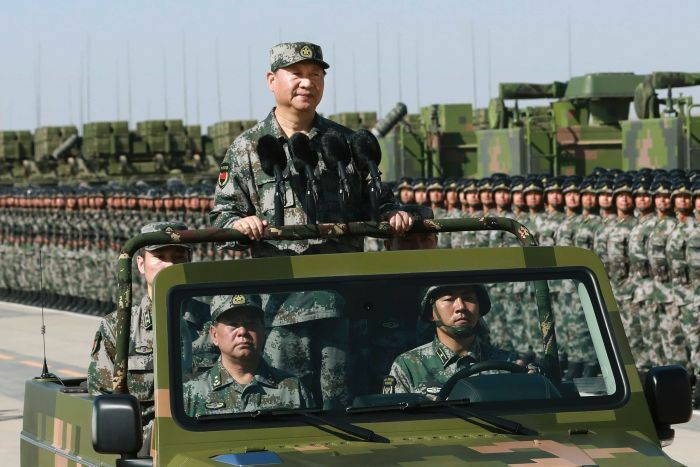 The total annual domestic security budget hasn’t been published since 2013, when overseas media noted how it outstripped the rapidly growing funding for China’s military. China’s massive internet censorship operation is also deeply linked to the overall concept of safeguarding stability. Check out the comments to see what our readers thought about China’s security obsession. The normalisation of such a huge security presence is helping create a growing belief here that China is far safer than countries abroad. Well-publicised cases of Chinese students and young nationals being kidnapped or murdered in the United States, Australia and elsewhere along with news coverage of mass shootings and violent protests in the West appear to affirm the idea that China’s security state is superior. When similar incidents happen domestically, such as a violent face-off between a group of Muslims and police in the northern city of Tangshan in August, censors scrub any mention of it. Events that could dominate the news agenda for days in a country like Australia can be neutralised and snuffed out before most people have a chance to hear about them. “Chinese society is stable and orderly, people happily live and work in peace,” President Xi Jinping recently told an Interpol conference in Beijing. “More and more people believe China is one of the world’s safest countries. This emphasis on stability and security is only likely to increase in the weeks ahead as Mr Xi presides over a major Communist Party meeting confirming his leadership for another five years. “The idea of stability is central to the Chinese Communist Party”, said Dr Michael Clarke, a specialist in China’s domestic security policies at the Australian National University. “It also plays into this wider narrative of China returning to its place of great power status and its ability to be a leader in international affairs. But it is also actively luring Taiwan’s best talent, contributing to an acute brain drain that not only threatens the Taiwanese economy, but has prompted fears that Beijing, which claims the island as its own territory, is using its economic clout to try to buy political influence. China has targeted Taiwan’s educated elite for years, but a recent uptick in job and education incentives suggests a shift in tactics since cross-strait relations soured over Taiwanese President Tsai Ing-wen’s refusal to accept Beijing’s policy that the island of 24 million is part of ‘One China’. Its attempts to punish Taiwan through international isolation, blocking it from United Nations meetings and poaching from its small remaining pool of diplomatic allies, appears only to have fortified Taiwanese resolve to forge their own identity. The young in particular identify more acutely with Taiwan as their home country and China as a giant neighboring state. But the long term impact of offering millennials a higher standard of living is hard to predict. China has made no secret of its belief that financial benefits can, over time, dilute, and eventually displace national identity and advance its unification agenda. Reports emerged in April that Beijing would appeal to business grass-roots through the All China Federation of Taiwanese Compatriots, led by Wang Yifu, a former advisor to President Xi Jinping on Taiwan. Last month, China’s education ministry announced it would halve the quota of Chinese students in Taiwan while relaxing entrance rules for Taiwanese at mainland universities, fueling suspicion of attempted social engineering. “If China is growing at 6 percent a year and Taiwan is growing at 2 percent a year, which is going to be the most attractive place to go to stake out your career?” asks Michael Zielenziger, Asia expert and a managing editor at Oxford Economics, a U.K.-based economics and research consultancy. “Taiwan comes in poorly for a number of obvious factors. The population is not increasing…It’s getting older,” says Zielenziger. Caught in a vicious cycle, low wages have left young people less inclined to start a family, contributing to declining birthrates. The resulting exodus leaves less workers to support the swelling ranks of the old, pushing the pensions system towards the brink of bankruptcy. “They are high level managers, engineers, they are rich, their income is high,” he says. But the notion of China presenting itself as the land of opportunity in exchange for Taiwanese loyalty is misguided, believes Taipei-based analyst Michael Cole, a senior fellow at Nottingham University’s China Policy Institute. Firstly, China has no clear strategy to win over Taiwan. “Right now, they don’t know what to do,” he argues. “They’ve long been infatuated with notions of economic determinism. 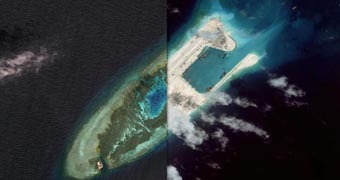 They tried that with Tibet and they tried that with Hong Kong to an extent,” Cole says. Lo Chih-cheng, a legislator with the ruling Democratic Progressive Party (DPP), agrees that young people will see through attempts to politically manipulate them. “They want to show especially to young people, that China is their future, and Taiwan has nowhere to go to but to turn to China. That’s their strategy: Taiwan has to depend on China for economic development,” he says. Others are more concerned that the long term impact of offering financial security to an entire generation, could slowly erode resistance to China’s political ambitions. Unlike Hong Kong, freedom of speech and democracy is not directly under threat for now in Taiwan, giving the young fewer reasons to push back. Taiwanese identity is strong, but willingness to advocate independence less so. “China is just too big and in Taiwan you cannot live without China being involved in your business,” he explains. Ross Feingold, a Taipei-based lawyer and public policy analyst, agrees that the Taiwanese government is not doing enough to stem the brain drain. “One way to look at it is if China succeeds in getting young people to remain there during election time and not return home to vote for the DPP, that that would also work to China’s advantage,” he says. The United States has no clear plan for dealing with the various crises it faces in the Middle East, according to one of the top US allies in the fight against ISIS. The Iraqi Vice President, Ayad Allawi, said the US was “absent” from its traditional role in maintaining global stability. Iraqi forces, supported by the US, are in pitched battleto retake the last blocks from ISIS control in Western Mosul, the extremist group’s last major stronghold in Iraq. But Allawi said the US had abandoned its leadership role. 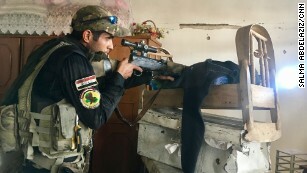 A wide spectrum of international forces — including the US, the Kurds, Iran,and the governments of Syria and Iraq, — have succeeded in fighting ISIS back from the stunning territorial victories it gained in 2014. Mosul is now almost back in Iraqi government hands; across the border, the Syrian Democratic Forces (SDF), a coalition of mainly Kurdish and Arab fighters, launched the final phase of their battle to recapture Raqqa earlier this month. 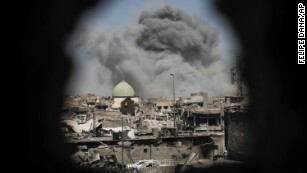 But Iraq has intelligence that ISIS is attempting to “forge an alliance” with Al Qaeda, the Islamist group from which it was spawned in 2013, Allawi warned. Discussions are taking place in both Iraq and Syria, he said — mediated by former al Qaeda members who never joined ISIS. “It is the unification of the evil forces,” he said. Daniel Coats, America’s top spymaster, informed Congress this week in an intelligence briefing that Iran’s ballistic missile work continues unimpeded and could be used by the Islamic Republic to launch a nuclear weapon, according to unclassified testimony. 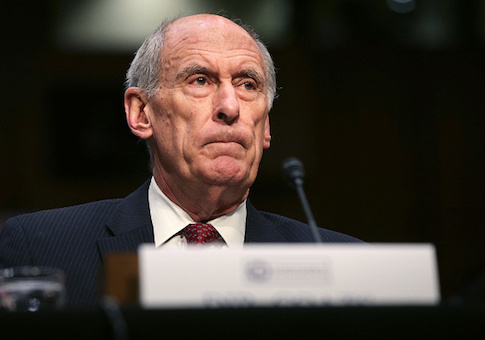 Iran “continues to leverage cyber espionage, propaganda, and attacks to support its security priorities, influence events and foreign perceptions, and counter threats—including against U.S. allies in the region,” Coats testified. This includes cyber attacks “directly against the United States,” such as in 2013, when an Iranian hacker penetrated the computer systems of a U.S. dam. The U.S. intelligence community has confirmed that Iran is developing “a range of new military capabilities to monitor and target U.S. and allied military assets in the region, including armed UAVs [drones], ballistic missiles, advanced naval mines, unmanned explosive boats, submarines and advanced torpedoes, and anti-ship and land-attack cruise missiles,” according to Coats.